Last December after traveling on 32 press trips and bloating to the largest I’ve ever been I decided to make a serious change in the way I live my life. I opted to focus less on food writing and more on stories that are calorie free (give it up for tech, the arts, fashion and beauty). While reducing my calorie consumption has been great I also realized I had to cut back on travel as zig-zagging across the globe had me living in a constant state of zombie jet lag which made giving it my all at the gym a major struggle. By making a few tweaks to my lifestyle I’m happy to say I’ve lost 20 pounds since last Christmas and have kept it off even when wooed by the most decadent dessert buffets. I realized the best way for me to keep the weight off was to remove the guessing game of “what am I going to eat today.” As folks with a busy schedules know it’s always easier to feast on fat and sugar rich comfort foods than take the time to plan out a week of fresh meets healthy meals. Over the past few months I’ve been eyeing the power bowl craze and was keen to try it out for myself. I loved the idea of fitting a well balanced, healthy meal into one bowl. Adopting a mantra of “keep it simple stupid” is often the best way to go about breaking bad habits. 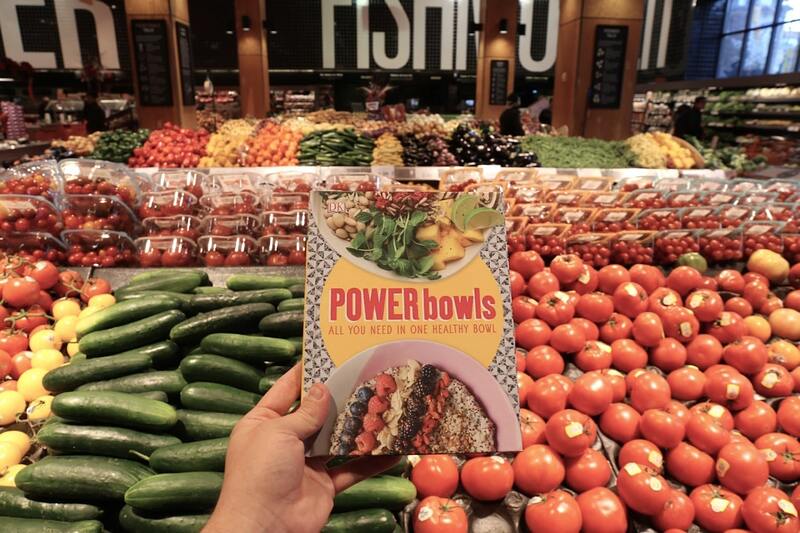 If you’re serious about making a healthy New Years resolution that you can maintain throughout 2017 grab a copy of Power Bowls: All You Need in One Healthy Bowl (DK Publishing, 2016). It’s a fab bite-sized guide to the tastiest food trend featuring colourful, mouth-watering recipes and images. You can easily pack your five-a-day into a bowl with Power Bowls 25 healthy bowl recipes that are easy to prepare and super flexible, so you can be creative in the kitchen. Whether you’re looking for quick eats or healthy dinners, Power Bowls is packed with superfood solutions for every meal, with recipes for breakfast, dinner, and even on-the-go. It’s simple to get your daily fix of fruit, vegetables, and grains with these quick and easy recipes which boost your energy the natural way. I read Power Bowls cover to cover, took a ton of notes on my favourite recipe ideas and crafted three dishes which will hopefully inspire you to host your very own Power Bowl Party. I combined two of my favourite breakfast staples and topped them with with a variety of nuts, seeds and fruits to offer an addictive bowl worth waking up to. 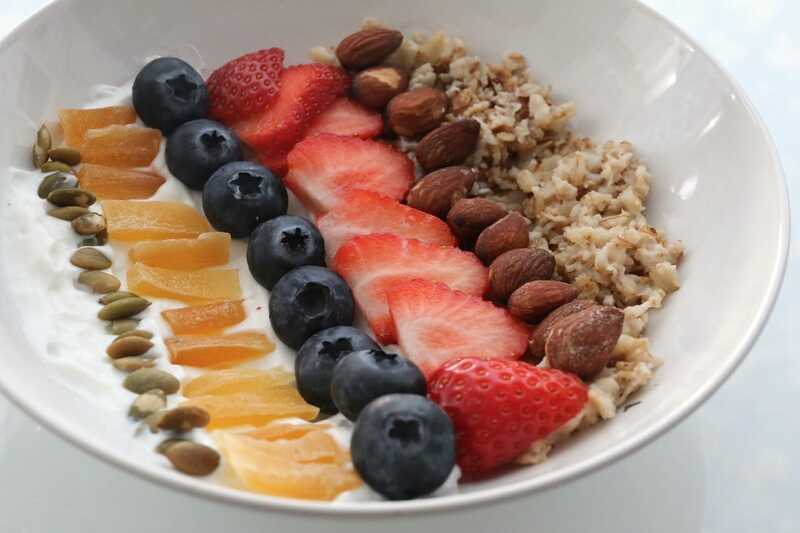 My go-to breakfast bowl features organic oatmeal, greek yogurt, smoked almonds, dried mango, pumpkin seeds, blueberries, strawberries and a whisper of maple syrup. Ideal for a mid-day post workout I borrowed inspiration from Mexico to create a protein packed burrito bowl. 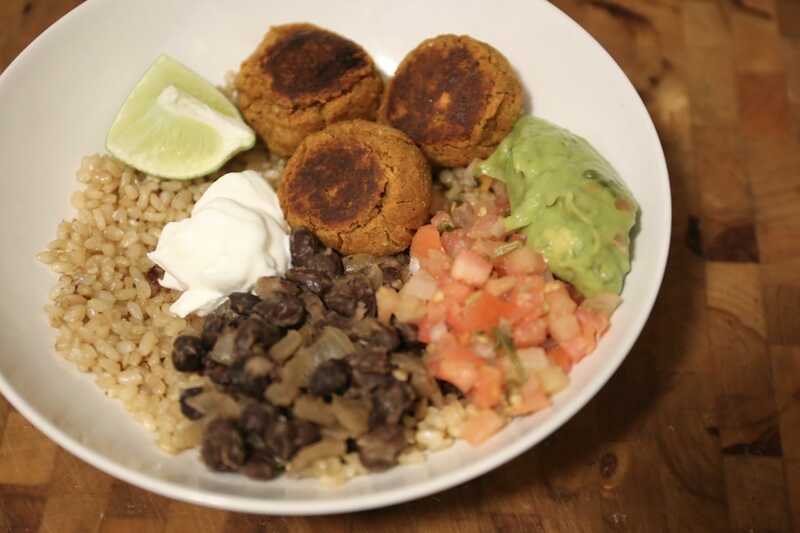 This lunch of champions features piping hot baked sweet potato falafel, black beans, guacamole, salsa, organic brown rice, greek yogurt and spritz of lime. 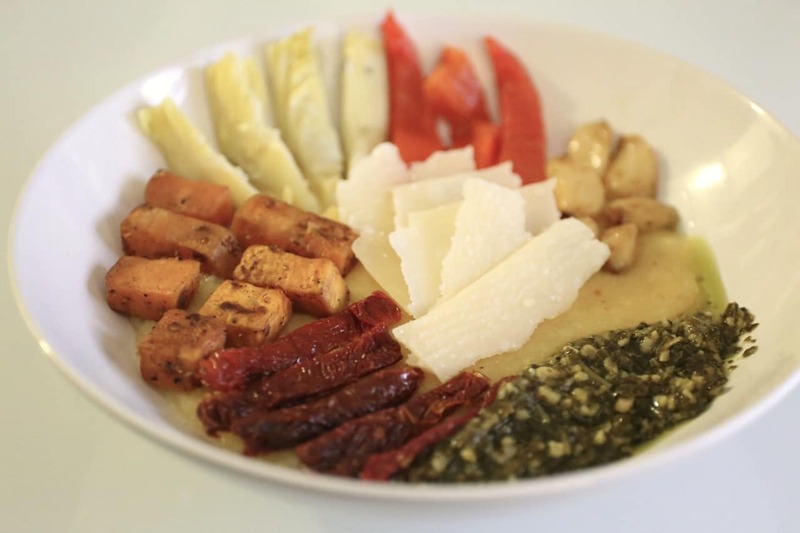 For supper I went straight to Italy, inspired by hearty polenta porridge and classic antipasto. The dish is perfect for serving to friends at a dinner party as each guest can top their steaming bowl of polenta with their favourite fixings. I’ve topped my porridge with roasted sweet potato, pickled red pepper, garlic confit, artichoke, sun dried tomato, pesto and slivers of parmeggiano reggiano. I was looking all over for millet to make that yummy Breakfast Bowl we had at Vic’s Cafe in Picton…remember? Finally found millet at Wholefoods. Next day made the exact Royal Breakfast Bowl on Vic’s Cafe Menu……amazing…..I was completely satiated for the entire day and didn’t have any cravings for anything until dinner time. Got to get me that DK Power Bowl Book!